We think pain and pleasure or love and hate are opposites of one another. We think of these emotions as opposite ends of the spectrum, as if each lies on either side of a single line. In either case, they are simply variations of one another; unique but related; two sides of the same coin. But they are not opposites. In both cases, we are experiencing some kind of emotion. Whether you experience pain or pleasure, love or hate, you are still experiencing something. So the opposite of pain isn’t pleasure, nor is the opposite of pleasure pain. 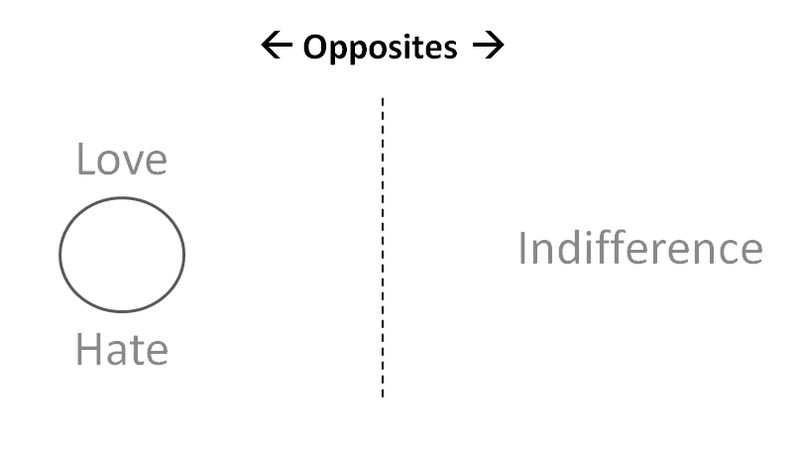 The opposite of both is numbness – it is indifference – it is nothing. When a project breaks, we might experience anger at ourselves because we failed, fear that this case isn’t unique and that we might never succeed, or jealousy of others for effortlessly accomplishing that which we suffer for daily to create. When a goal comes to fruition, we might experience joy in its realization, pride that we have accomplished so much, or gratitude that we were given such an unlikely opportunity, with such an unlikely skill set, in such an unlikely environment, to make our dreams reality. In either case, we are experiencing the emotions of someone who cares. If you want to experience the latter, you must be willing to experience the former; that’s the price you pay when you care, when you’re invested in the outcome, when you’re committed. But if you’d prefer to never feel the anger, fear, or jealousy of failure – the pain of failure – then you only have one option: become indifferent. Indulge in the emotional morphine of indifference and all the pain goes away; and so does all the pleasure, all the happiness, all the joy. That’s the paradox; that’s the battlefield; that’s the choice. I’m so glad the post resonates Caylie. That is awesome about the ebook! Keep the success going! It’s not easy, but, of course, that’s what makes it worthwhile.